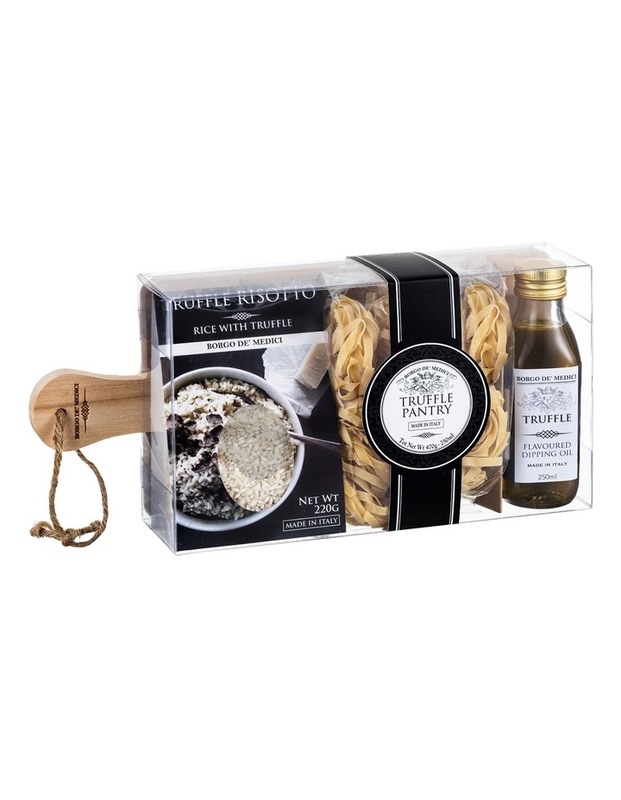 Black Truffle Hamper Pantry: This box will really help you to bring home a bit of the world famous italian kitchen just with a bit of help. 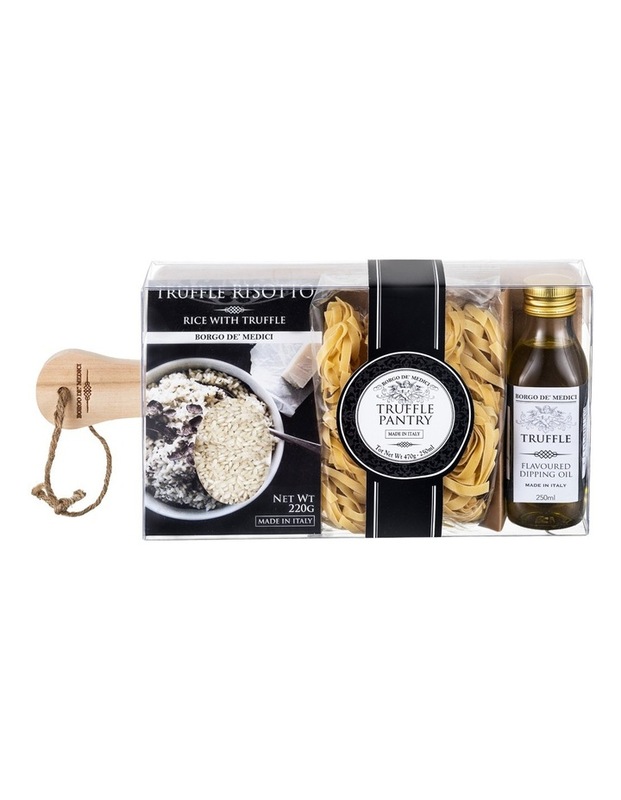 First of all you need a bunch of friends to impress, then you can easily organize a typical high-carbs italian dinner with a selection of two mains courses: Black Truffle Tagliatelle pasta with Truffle flavoured dipping oil (small tip: just after draining pasta, drizzle on it some Truffle dipping oil and add some grated fresh Parmesan cheese) and the Black Truffle Risotto. How to make a risotto step by step: Put 750ml of vegetable stock in a saucepan and keep it to gentle simmer. Meanwhile chop finely half of an onion. Melt 60g (1/2 stick) of butter in a saucepan and then add the chopped onion, let it cook for 5 minutes, then add the Black Truffle Risotto and genlty wisk while cooking for about 10 minutes, until it will be soft, golden and translucent (not browned!). Pour 60ml (1/4 Cup) of white wine and boil hard until it will be reduced: during this process all the alchool will evporate. Now it's time to add the stock one ladleful at a time and stir gently until each ladle of liquid will be absorbed by the Risotto. Don't let the rice dry out and add stock if necessary. Continue until the Risotto will be tender and creamy and the grains still firm (will take around 15-20 minutes: remember to taste it during the whole process!). Last but not least add other 60g (1/2 stick) of butter, grated Parmesan as you please and stir well. Just after that you will season it with salt and pepper. Buon appetito!